Played college football at the University of Wyoming from 1968-1971, starting at offensive tackle his 2nd and 3rd years and defensive end his senior year. Named to the WAC all-academic teams in 1970 and 1971, he was taken in the 1972 NFL Draft by the St. Louis Cardinals as the 110th pick in the 5th round. 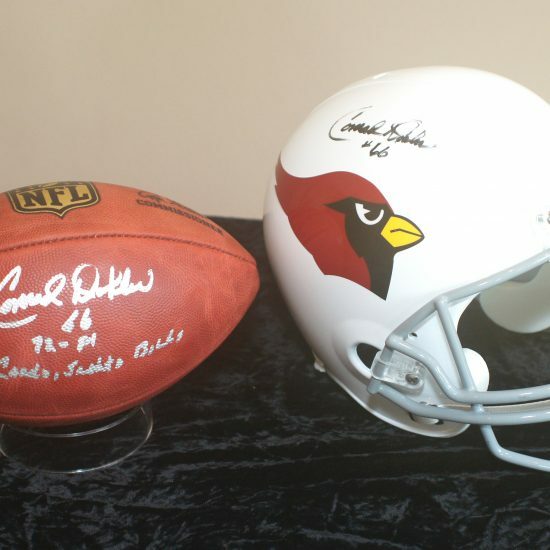 Dobler played with the Cardinals (1972-77), New Orleans Saints (1978-79) and the Buffalo Bills (1980-81). Playing right offensive guard, he started every game but four in his career. In his 10 years in the NFL his teams had five years of post season play. Additionally, each team he played for led the league in fewest sacks allowed (a total of six times in his career). In 1975 the Cardinals set the record for fewest sacks in a season by only allowing eight sacks. Dobler’s play was rewarded by being selected for three consecutive Pro Bowls in 1975, 1976 and 1977. Conrad Dobler was an unheralded 5thround pick out of Wyoming when he came to the NFL in 1972. By the time he retired from the league in 1981 Dobler had gained a reputation as one of the best – and most feared – offensive linemen in the NFL. Dobler’s story started on October 1, 1950 when he was born in Chicago to John and Clara Dobler. His father had German and Irish ancestry. His mother, the former Clara Broniecki, was the eighth of 12 children born to Polish immigrants Ignatius and Victoria Broniecki. When Conrad was two, his older brother Clifford developed a serious case of asthma, so in 1953 the family left Chicago for Arizona. They struggled financially, so the family then moved to Twentynine Palms, California, where the family operated a home-delivery milk business. Conrad and his six siblings attended a Catholic school called Blessed Sacrament. His parents put him to work for much of his free time, so Conrad didn’t get much involved in sports until he got to high school. He possessed excellent size and speed, and excelled in track and basketball as well as football. He developed into an all-league running back, and received various scholarship offers. Conrad decided to play football at the University of Wyoming. Willing to play any position to get on the field, he agreed to become an offensive tackle, a position he had never played before. As a senior, he switched to defensive tackle, and was defensive MVP. He also earned All-Conference academic honors. Conrad never expected to play pro football, so he was surprised when he got a call from a reporter saying that he was selected by St. Louis in 1972 with a 5thround pick. At camp he was put on the offensive line, and played there through the preseason. Before the first game, however, he was cut. Just as he prepared to begin a teaching career, he got a call from the Cardinals: the team’s starting right guard had injured his knee, and they wanted Dobler back. Conrad was determined not to get cut again; by his fifth game the rookie was starting. Before long Dobler became an outstanding NFL lineman, combining the work ethic instilled by his parents with his physical tools and incredible determination. He played right offensive guard more like a defensive player, with a very aggressive style. He was elected to the Pro Bowl for three straight seasons beginning in 1975. That year he was part of a line that allowed only eight sacks, then an NFL record. That line, which included Hall of Famer Dan Dierdorf, is considered one of the best of all time. 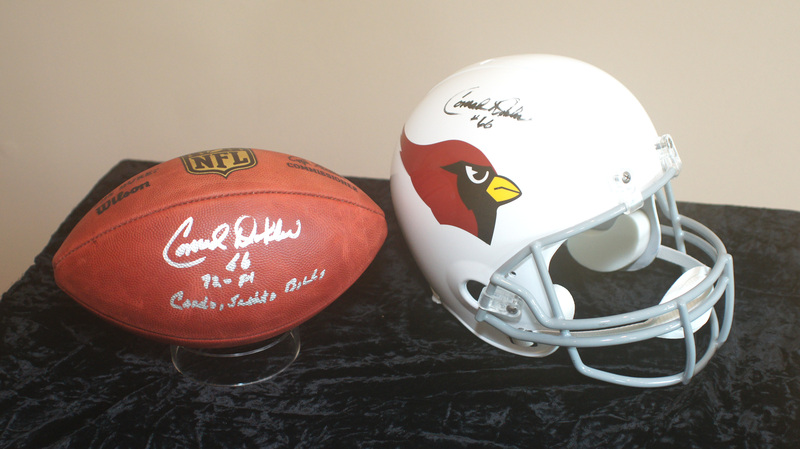 The Cardinals won NFC Eastern Division championships in 1974 and 1975, and went 31-11 from 1974 to 1976. That reputation was solidified when Sports Illustrated anointed him as the dirtiest player in the NFL in a 1977 cover story.He took advantage of that notoriety, using it to intimidate defenders. Many times opponents were more concerned about what Dobler was going to do rather than making a play on the ball. In 1978, following a contract dispute, the6-foot-3-inch, 255‐pound guardwas traded to New Orleans. After going 3-11 the year before Saints went 7-9 that season, though Dobler missed much of the season with knee injuries. He didn’t miss a game the following year, and the Saints went 8-8, which was the first .500 season in the 13-year history of the franchise. In 1980 Dobler was traded to Buffalo. Despite his injury history, Coach Chuck Knox wanted him to provide veteran leadership to the young, rebuilding Bills. “They’ve started calling me an inspiration,” Dobler noted at the time. “That’s quite a transition, isn’t it, from the meanest man in football to a medical wreck to an inspiration? Someday I’d just like to be known as a football player.” By that time Dobler had a long list of injuries, but he helped the Bills improve from 7-9 the year before to 11-5 and a playoff spot. In his second season with the Bills Buffalo went 10-8 and made the playoffs again. However, Dobler also had many struggles when his playing days were over. He was often in great pain, and underwent numerous surgeries due to injuries suffered during his NFL career. In addition, his wife, Joy, became a quadriplegic on July 4, 2001, when she fell out of a hammock during a backyard barbeque and suffered a broken neck. Caring for Joy placed a severe emotional, financial and physical strain on Conrad. She passed away earlier this year.